Welcome to The Children’s Place Gift Cards for Kids Clothes Giveaway! The Children’s Place has some of the best collection this year for kids clothes 2015. Whether you want to buy trendy Boys Clothes or stylish Girls Clothing ore even Baby Clothes, they offer children’s apparel and accessories at the best price. And they are giving away some gift cards to our readers as well. 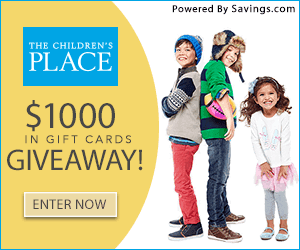 Savings.com has teamed up with The Children’s Place to give away $1,000 worth of gift cards! 40 winners will receive a $25 gift card to The Children’s Place! Monday, November 9th at 12:00 AM ET to Friday, November 13th at 11:59 PM ET. Open to US, 18+ years of age. Users can enter the giveaway by heading to The Children’s Place page and submitting their email address on the form at the top of the page. The winners will be chosen via a lottery drawing and notified on Tuesday (11/17) via the email address they used to enter. Enter Kids Clothes 2015 Giveaway Here!